I don’t and won’t have a Galaxy Gear so can I please disable the stupid app on my phone!? Welcome to the new residents! 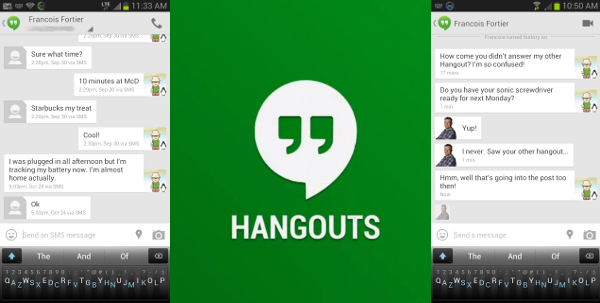 This is NOT the Hangouts 2.0 I was anticipating! Woohoo! I finally got Hangouts 2.0 on my phone!!! Time to activate SMS integration and enjoy the glorious seamless world of messaging. The SMS integration is half-baked! SMS messages should be integrated into the same thread with all the other contact’s messages. When I reject a call I often reject with a message – a text or SMS message. So when the person responds it’s via SMS, so if I have a Hangout with that person it gets messy, there’s no continuity. Also, SMS messages used to produce a lock-screen short-cut for quick access but not any more with Hangouts! I know there’s some bearable work-arounds but the experience has definitely been diminished. And from my PC or tablet I still need to use MightyText to send SMS (to people who don’t use Hangouts). Google should just buy MightText and integrate their functionality into Hangouts (and SMS Backup+ too while they’re at it – those apps provide essential functionality and they deserve more money than they make from their apps). So basically, there’s fragmentation everywhere!!! This pancake recipe comes from Patricia’s grandmother on her father’s side. They’re fluffy and light and go really well with Maple Syrup. You can keep the pancakes warm in the oven while cooking them and then serve everyone at the same time. Garnish with maple syrup, cinnamon, or cake sprinkles! And if you don’t finish the whole batch this breakfast, then put the left-overs into a freezer bag and save for another day. Just pop them in the toaster and they’re ready in no time.